A pump sales and service company in central NJ. 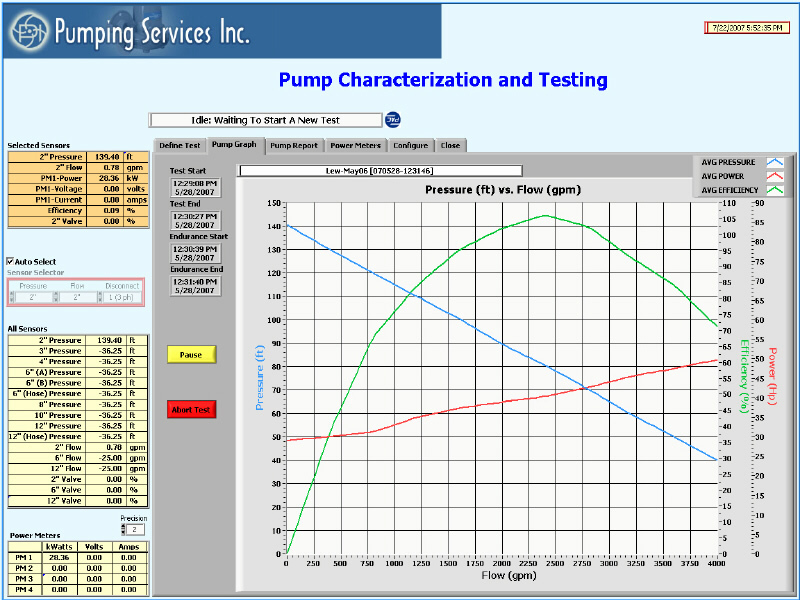 wanted to provide their customers with accurate pump performance curves that define the performance of new and currently owned pumps, over the entire flow range of the pump. 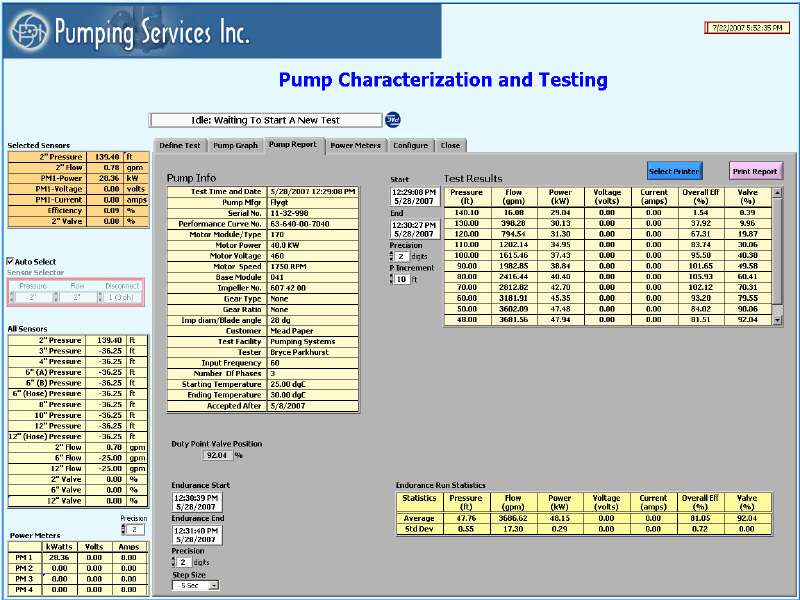 Pump manufacturers sometime provide performance tests using data taken at up to 5 operating (flow) points. They built a pump test stand with an associated water pool to facilitate on-site pump testing at their plant. They wanted a computer operated system that would automatically run the pump test, store the data and create a pump report. A typical pump test consists of sweeping the outlet valve from closed to open in many small steps while logging all incoming data. After this is done, the outlet valve is set to operate the pump at its rated flow. The pump is then endurance tested by operating at rated flow for 30 minutes. 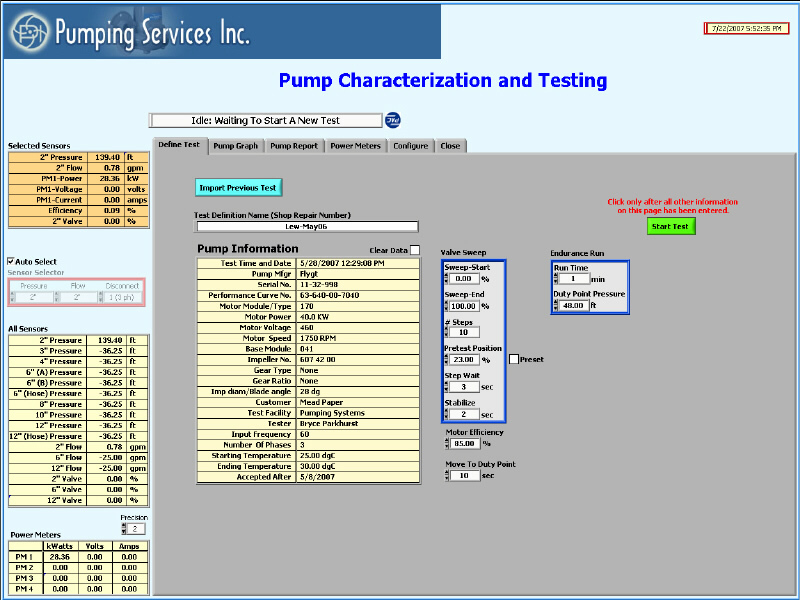 Data acquired during the endurance test period is used to calculate operating statistics for important pump measurements. Pump pressure, flow, electrical power and water temperature are read by the computer via National Instruments’ FieldPoint hardware. A specially developed Modbus driver was required to interface to the power meters on the test stand. The PAC TrendSafe software, with its integrated Data Historian, was used as the platform for developing the LabVIEW based monitoring and reporting software. The TrendSafe software provided most of the basic functions required for testing software. Some functionality was customized to meet all of the system requirements.